Odissi, also called the' dance of gods', is the intrinsically passionate style of dance that grew from the traditional temple dance. It has charm, grace, lyricism and sensuousness. 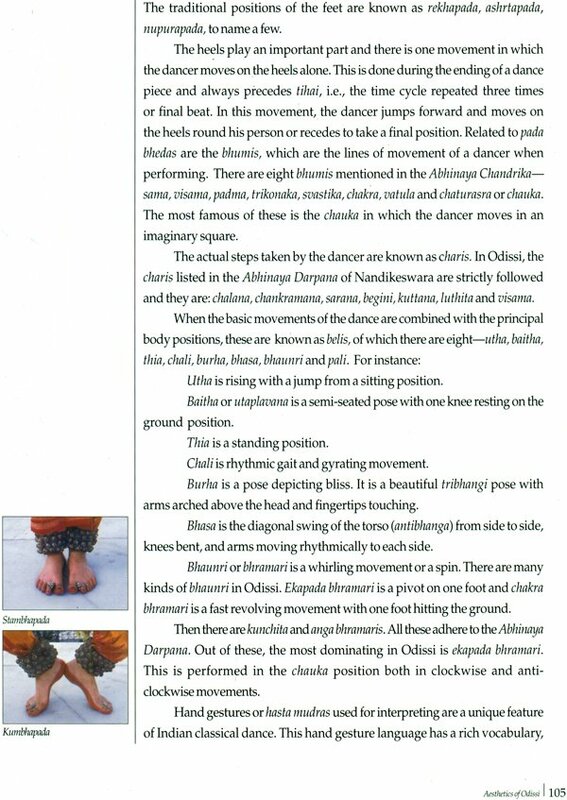 In the words of the noted Hungarian Indologist, Charles Fabri, it is 'the most perfect Indian classical dance form'. Classical dance is understood to be the synthesis of body and mind because it merges physical energy with emotional and spiritual enthusiasm. India has had many forms of classical dance which have flourished, declined (under foreign influences) and been revitalized. Indian philosophy suggests that the realm of 'living and that of divine are one in essence' and one way to affirm the underlying unity of the two is through dance. Lord Shiva of the Hindu Trinity of Gods is also called Nataraja or the Lord of Dance. The presence of Odissi dance, in terms of archeological evidence, was found in the cave sculptures in the hills near Bhubaneswar in Orissa dating back to the first century BC. There have been vast changes in its physical form and its role in religion and society from one century to another; its style and character have alternated under the influence of various religions and dynasties. All this has given Odissi its distinct and sacred character-blending sanctity with beauty and art with religion. 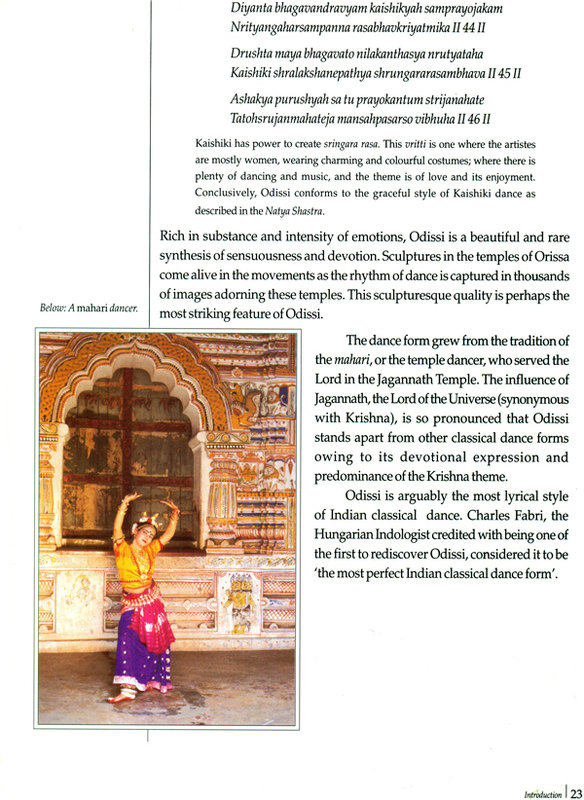 Odissi -The Dance Divine is a chronological survey of the form and style of the dance. The art form today known as Odissi is the descendent of the temple dance that evolved in the Jagannath Temple in Puri. Revered as one of the holiest places, the temple was the centre of culture, religion and artistic traditions. In the inner sanctum of this shrine was born the dance of the mahari or temple dancer, which became a tradition and finds expression in the Geeta Govinda that presents Odissi dance as a niti or lifestyle. The book explores the aesthetics of the dance, which is a living tradition till today. Besides that, it gives the readers a brief outline of the architects and contemporary gurus of the dance, and the eminent dancers who are in the forefront of the scenario. Ranjana Gauhar is a well-known name in the field of Indian classical dance. She is a leading exponent of the dance form 'Odissi'. Ranjana has experimented with chhau dance and successfully blended it with her own inimitable style of Odissi. She has also trained in Kathak and Manipuri. Ranjana has taken Odissi to various parts of the world. She has performed at the festival of India in the UK, Queen Elizabeth Royal Festival Hall, The Royal Hall of Plymouth, the Commonwealth Institute and Oxford University, to name just a few. She has performed in over twenty countries including UK, Germany, France, Italy, Holland, Greece, Switzerland, Japan, USA and Pakistan. Ranjana has been a visiting faculty member at the Hyderabad University, teaching classical dance at the Master's level and also at the Summer Akademy, Berlin. She was awarded the senior fellowship by the Ministry of Culture, to research in the Temple Tradition of Odissi Dance and has been honoured with the Indira Gandhi Priyadarshini Award. She is also a recipient of the Padma Shree Award. Dushyant Parasher graduated from Delhi College of Art in 1972 and started his career as a graphic designer. He later joined advertising and worked as creative director for some of the leading advertising agencies. He has now settled as a travel photographer, writer and book designer. N.C. HILLS-The Enchanting Land and the Bird Mystery of Jatinga; BHUTAN-A kingdom in the sky and TEA -Legend, Life and Livelihood of India.